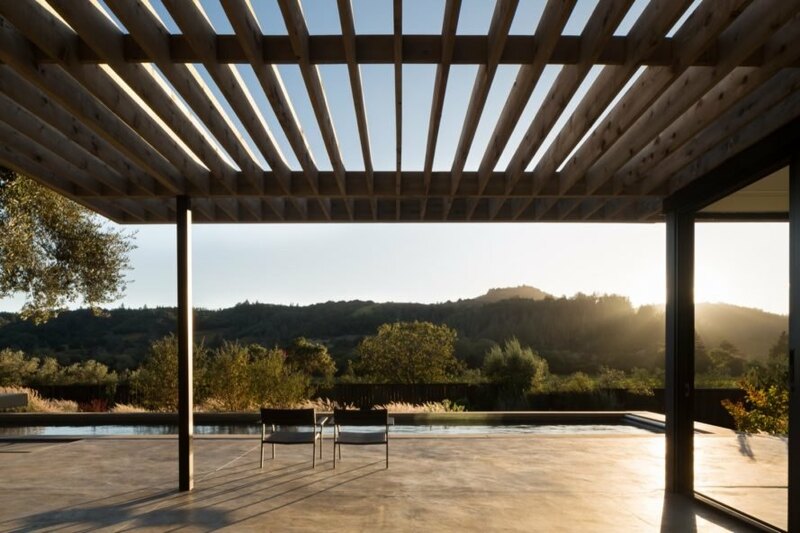 California-based architecture and design firm Ro Rockett Design recently added a pool house to a Sonoma County retreat that’s become so alluring, the clients decided to turn it into their full-time residence. Located in the northern California town of Geyserville, the property boasts stunning views of rolling vineyards and the rugged coastal landscape. 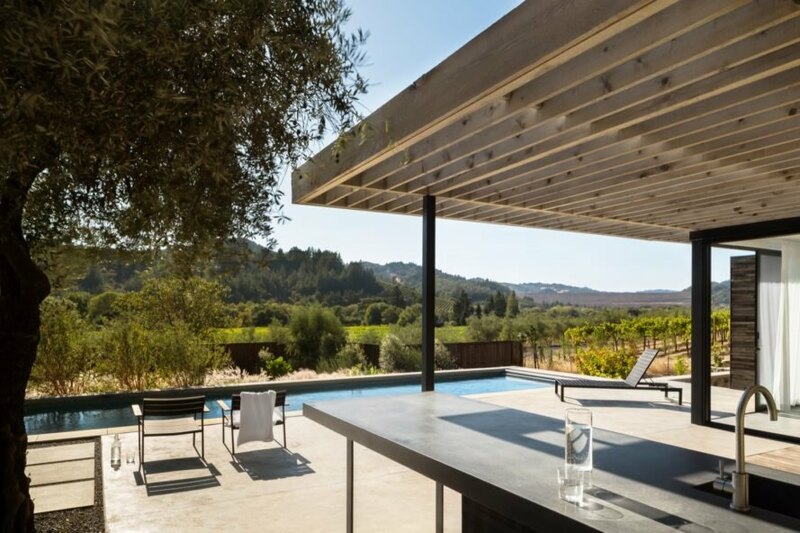 The Dry Creek Pool House is carefully situated to take advantage of these impressive vistas and features a natural materials palette and minimalist design to blend in with the surrounding environment. 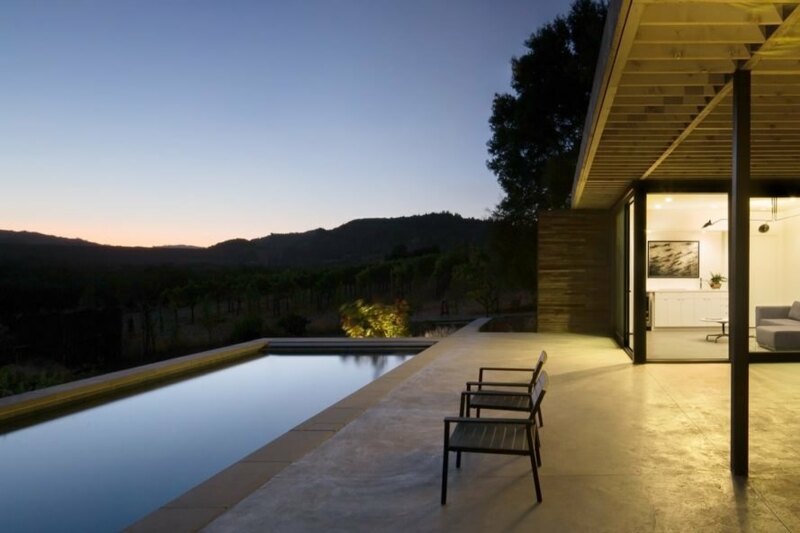 Built as part of a narrow holiday home, the Dry Creek Pool House is the latest addition to the property’s growing amenities, which include the saltwater pool, outdoor living area, gardens, bocce court and guest arrival with overflow parking. To obscure views of the adjacent busy roadway, the architects sited the pool high on the property so that the raised pool edge would obstruct views of the road from the pool house, which boasts panoramic views of the landscape. 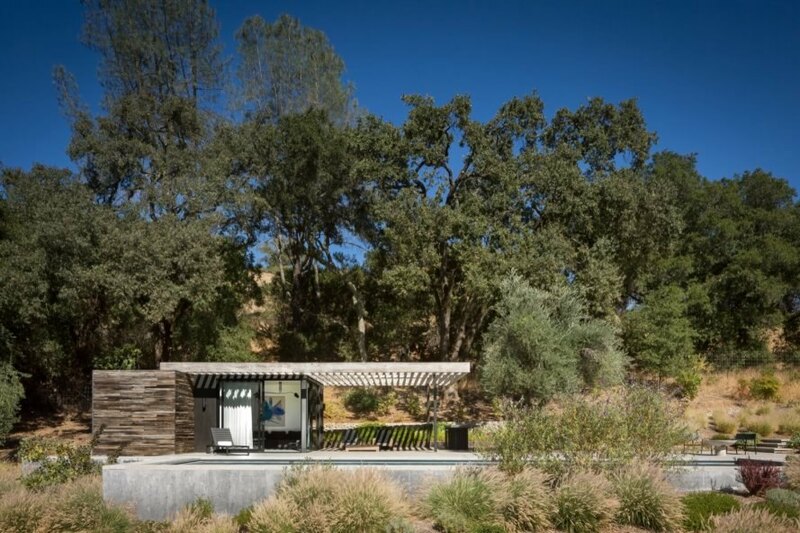 The modern and minimal design of the Dry Creek Pool House combined with a natural materials palette grounds the building into the landscape. 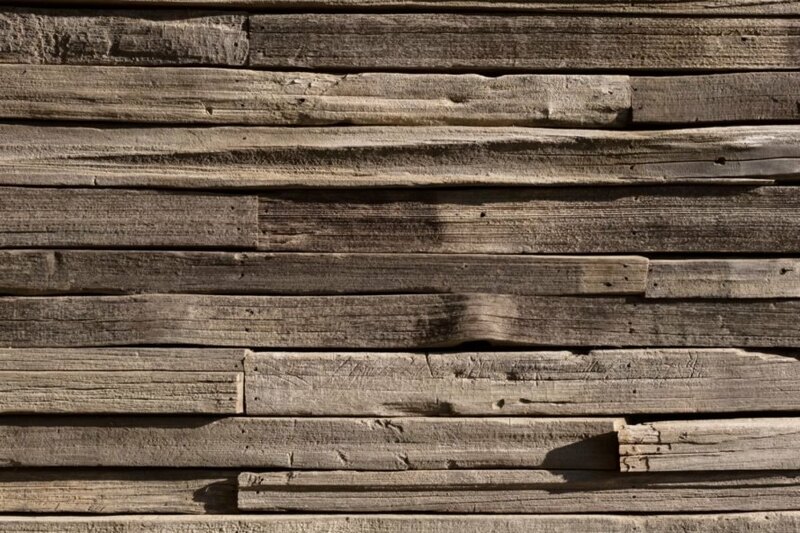 The vine stakes that partly clad the building, for instance, were reclaimed from the fencing that had surrounded the site. The structure is also built of plaster and topped with a floating cedar roof. A stone terrace connects the saltwater pool with the pool house. The pool house celebrates indoor/ outdoor living and consists of an outdoor living space with a dining area and bar. Another sitting area can be found inside in addition to a mini-bar and bathroom. Ro Rockett designers wanted the added design to embody the home's vistas. Designers raised the pool so it could block the view of the busy roadway. The views surrounding the poolhouse and pool allow it to feel private and secluded. Recycled materials were incorporated into the project. There are grape steaks incorporated into the private innards of the building. The poolhouse was built with a terrace to provide shade during tough summer days. The property was first conceived as a rustic retreat for the home owners. The narrow property was transformed into a full-time respite for the homeowners. The property overlooks rolling vineyards and the coast.